As fun as it is to predict which horse will win the 2017 Kentucky Derby, it is just as fun (to me anyway) to guess which jockey will win the Run for the Roses. Obviously, the two are very much related: few would argue that the rider with the best horse is — please forgive me — “in the driver’s seat” when it comes to posing for pictures in the Churchill Downs winner’s circle on the first Saturday in May. That said, the Kentucky Derby is not an ordinary race and I think it’s reasonable to at least entertain the notion that some jockeys excel under the shadow of the Twin Spires, while others disappear like the Detroit Lions come playoff time. However, unlike the horses, which typically have ample past performances to wade through — including previous races, workouts, speed and pace figures, etc. 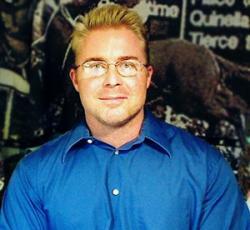 — most of the Derby jockeys have limited experience in America’s most prestigious race for three-year-olds. Hence, rating them by traditional standards, e.g. win and in-the-money percentages, is rather pointless. 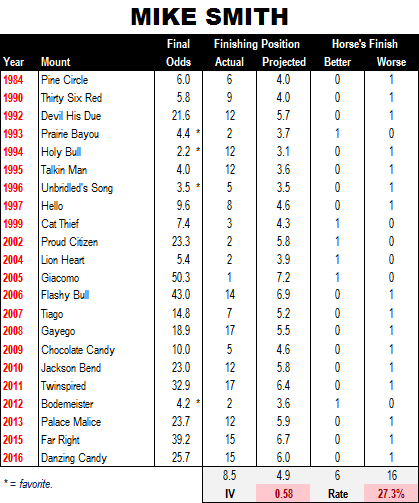 Thus, I scoured my racing databases in an effort to find a means of relating a horse’s final odds to its finishing position in a particular race. My idea being that by projecting a Derby entrant’s finish in the big dance, we can assess whether the horse — and, by extension, its jockey — met expectations, exceeded expectations… or failed to do either. I won’t bore readers with the math, but suffice it to say that I discovered a formula that works rather well and, in the coming months, weeks and days, I’ll be using it to rate some of the jockeys likely to be in the Derby starting gate. Let’s start with Hall of Famer Mike Smith. Smith has been aboard 22 steeds in the big race, including four — Prairie Bayou, Holy Bull, Unbridled’s Song and Bodemeister — that were favored; and he’s won the roses once (ironically with the longest-priced of those mounts). Interestingly, though, despite his overall record of achievement, Smith has generally underperformed in the Most Exciting Two Minutes in Sports — especially over the past 11 years, when just one of his 10 mounts outran its odds. From 1984-2016, Smith’s median projected Derby finish was 4.9, whereas his median actual finish was 8.5, yielding an impact value of 0.58 (anything greater than 1.00 is positive, while anything less than 1.00 is negative). Smith’s Derby odds currently stand at 8-1. 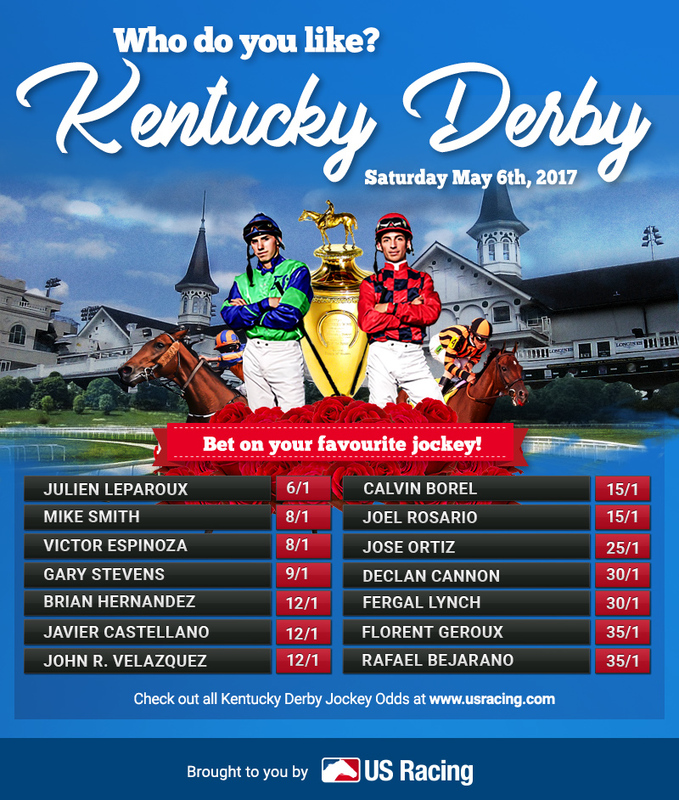 For the full listing of jockey odds, click HERE.